This heightens the body’s resistance to various chemical, physical and environmental factors. This is especially important in winter, when it assists the immune system against viruses and bacteria, helps to avert cardiovascular problems and appears to combat stress. which combat free radicals and thus hinder the growth of some tumours. which are toxic substances produced by poor nutrition. against various maladies including angina, bronchitis, cardiovascular diseases, hypertension, diabetes, gum disease, obesity, migraines, headaches and rheumatism. Encourage calcium and phosphorus in teeth and bones. by favouring the absorption of iron which is useful for the formation of red blood cells. Smokers are encouraged to have higher doses of vitamin C so as to reduce the damage to blood inflicted by nicotine. which stimulate the appetite, growth and digestion and aid the respiratory system and carotenes (precursors of vitamin A) which assist sight and help against a range of infections. As well as being our leading winter fruit, the orange confers many other benefits. Gargling orange juice helps fight gingivitis and stomatitis. An infusion made from the rind of oranges aids digestion. In beauty treatment the pulp is often used to make face-masks combating premature aging and wrinkles. The juice is an important ingredient in toning and astringent lotions. Oranges can be prepared in many ways: they can be juiced, made in to marmalades or jams, salad dressings and liquors. Using the rind, wonderful candied fruit can be made which are excellent in sauces, desserts and jams. 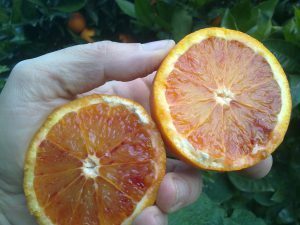 Blood oranges are excellent natural supplements, since they are so rich in substances which combat the everyday problems that your body faces.